I sometimes wonder if there is a semblance of a society or whether we are just a piece of land inhabited by 60 million-plus people. We are all struggling in this recession; it’s hard to make ends meet at the best of times but at the moment it’s becoming a harsh, mean society we live in. 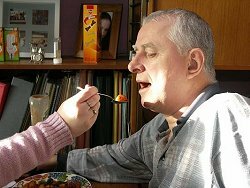 On a morning radio phone in this week we heard how some people are waiting a day to eat between meals so as to save money, two days later we heard how an elderly man in hospital was forced to lie in his soiled bed as the nurse on duty refused to clean him, or indeed the bed. These snapshots are not sensationalist; they are happening just as footballers paid £250,000 a week are stumbling out of night clubs and while MPs are filling out expense forms with varying levels of honesty. Food for thought; enough money to eat? The material gap between rich and poor is obscene but nowhere near as obscene as the way poor people are denigrated by the rich. I’m not a political activist but even I’m moved to anger when I see poor youngsters priced out of the education market by the obscene rise in tuition fees while the scum who screw us for outrageous amounts of money to buy our gas and electricity are allowed, even encouraged, by this government to rip us off even more as prices go through the roof. All in the hallowed name of the free market, of course. Those talented and spiv-like enough to play the markets laugh at the rest of us trying to eke out a living. There is of course a very simple solution to this kind of gangsters-in-suits mugging; tax these spivs to the extent that they bugger off to a tax haven thousands of miles away. Put government money into universities so poorer kids can study and pay nurses a decent wage so they have enough pride in their job to clean a bed full of an elderly person’s s**t while he lies in it. This is not socialism, it’s common sense for God’s sake.